Like women, some of the best bike rides are elusive. When I first met my wife, she wouldn’t give me the time of day. She was working the coffee bar at Panavision, and once in a while she’d bring in homemade cookies. I complimented her one day, on the taste of said cookies – to which her response was a fleeting moment of eye contact and a forced smile that could freeze a Jihad in the desert. A “thank you” or any verbal response was obviously unwarranted. Now I’ve been married 10 years with beautiful daughters. Yes, married to her. Yes, children with her. Yes, happier than I ever imagined, with her. Go figure. Cut to: A couple years ago. I attempted to climb Frazier Mountain on Northside at Taos. Mother nature shrugged me off, much like Angela did in my early attempts at courtship. The ride was abruptly cancelled by a gnarly hail storm that sent me fleeing for shelter (read about that effort here). During that ride, the weather became socked in, and I couldn’t even get a glimpse of the massive views I was pushing towards. Being stubborn and persistent by nature, this only peaked my curiosity. I vowed to come back and ride the Taos Ski Valley again. A look back from Frazier Mountain Road heading up to the summit. Halleluja! That time to give ‘er another shot arrived last weekend 🙂 With a lot more knowledge, and a little more luck, I got to bag two sweet summits in one jaunt. Instead of starting out at 2pm in monsoon season, I began the ride at 8am. Good call. Clear skies and perfect 60’s-70’s temps for the duration. The hills are alive! 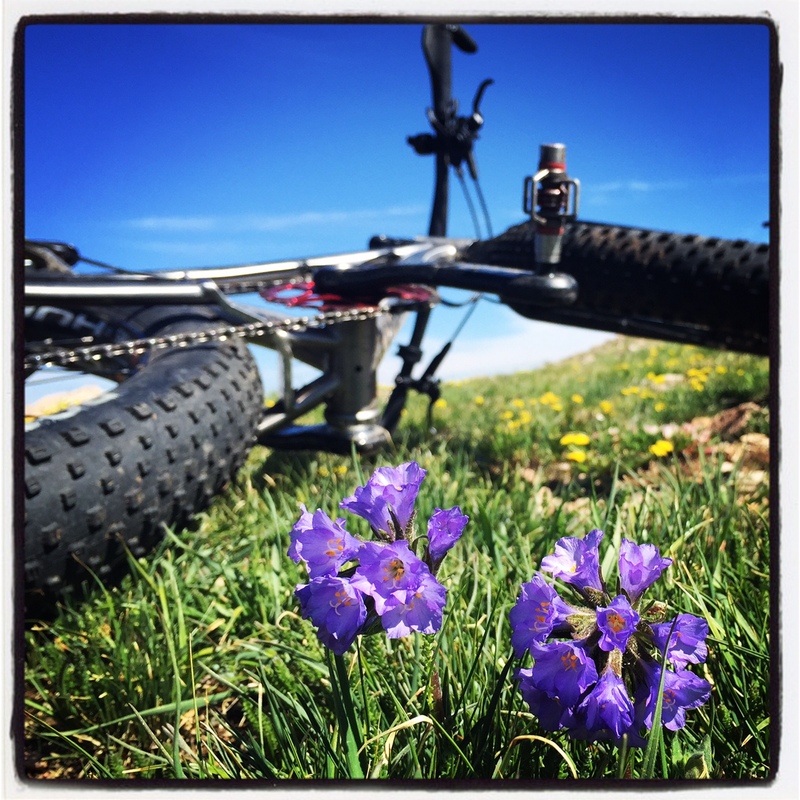 Gorgeous wildflowers and lush grass are everywhere on this high alpine ride. 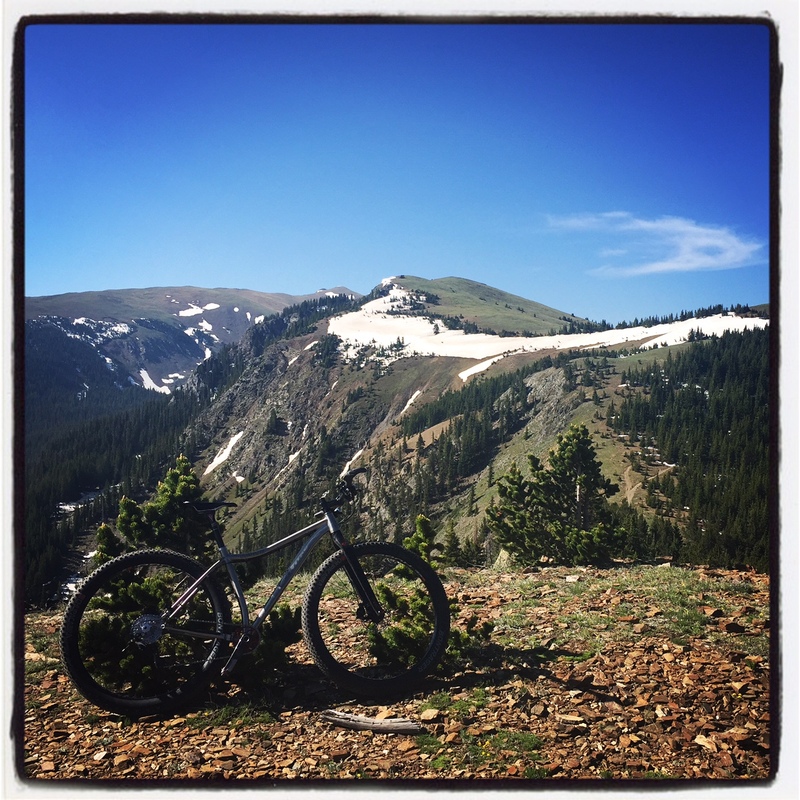 Taos had a big snow year, and there’s still much of the white love at higher elevations. The website actually stated that Frazier Mountain (12,163′) was still impassable, so my goal for the day was simply to top out on Bull of the Woods Mountain (11,640′) – where the local horseback guide had cleared the trail with his snowcat. After a looney tunes steep climb up Bull of the Woods Trail and Road that gained 2,500′ over 4 miles, I reached the peak. It did not disappoint. 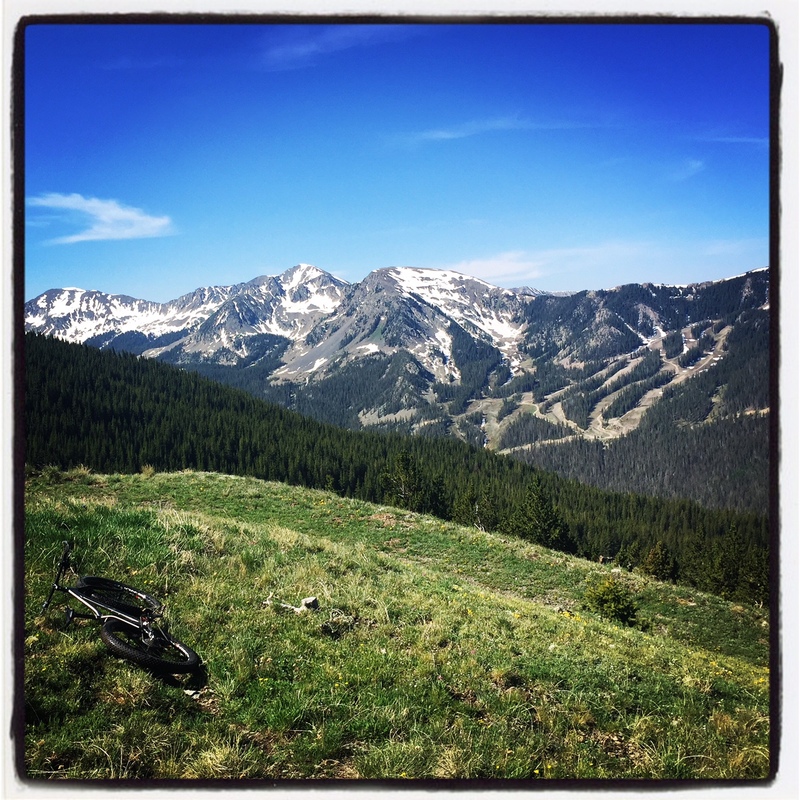 After popping out above the treeline and getting 360 degree views up and down the ski valley and towards Red River, my jaw stayed dropped – which helped maximize breathing and slowly push my lungs back in my chest – a twofer! After glancing over to Frazier Mountain, I thought “It doesn’t look too snowy over there… maybe I should try taking the High T trail across”. Yeah, I had to post hole through some deep snowfields for a bit. But then, boom – popped out on the sun-soaked south facing side of the mountain where the trail to the top was completely clear!! YES. This portion of the ride kept getting more and more stunning as I went along. This is my type of riding!! High alpine, exposed, lush, and remote (or at least the illusion of being remote). Taking a break at the Red River overlook before continuing up Bull of the Woods Mountain. Good thing it’s gorgeous up there, because this ride is an absolute grunt. 3,000′ of climbing over a mere 5.5 miles makes you wanna throw in the towel more than once. After all is said and done, the high alpine adventure was insane and memorable and a great shakedown ride for my newly built Carver Gnarvester 29+. 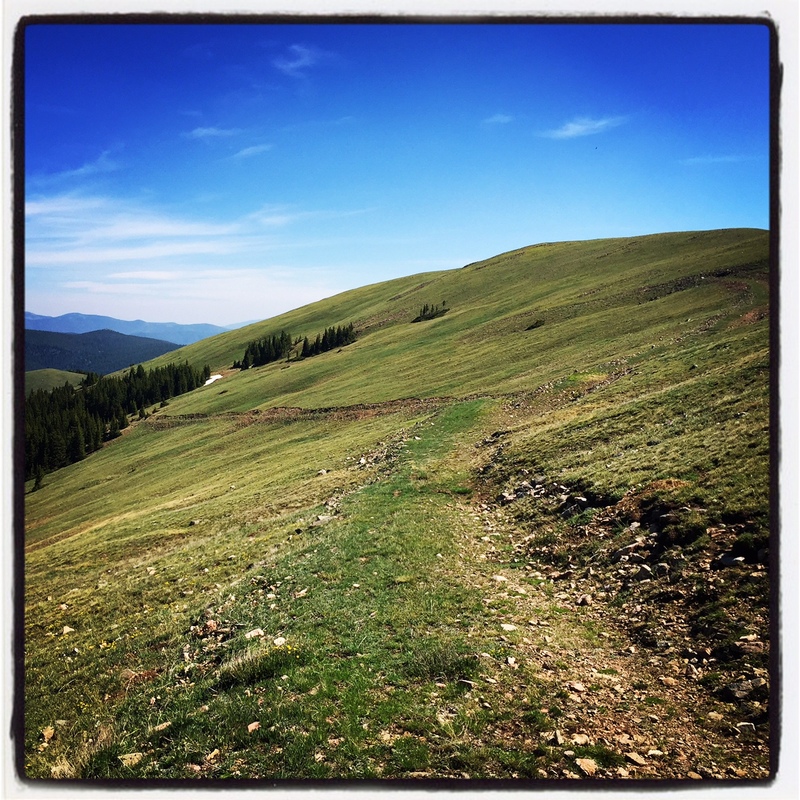 One last note – Northside at Taos is private land. You gotta drop $10 at the kiosk to gain access, but it’s well worth it for where it gets you. 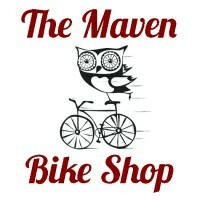 Don’t go here looking for awesome singletrack (although there are a few sweet ST trails). On the whole, this is backcountry, rugged, remote, poorly maintained doubletrack – mostly a means to and end. Once you reach the end, it’s a brake scorching descent that has you back at your car so quick it’s trippy to look back up and think, man, I was just up there… Wicked yo!! 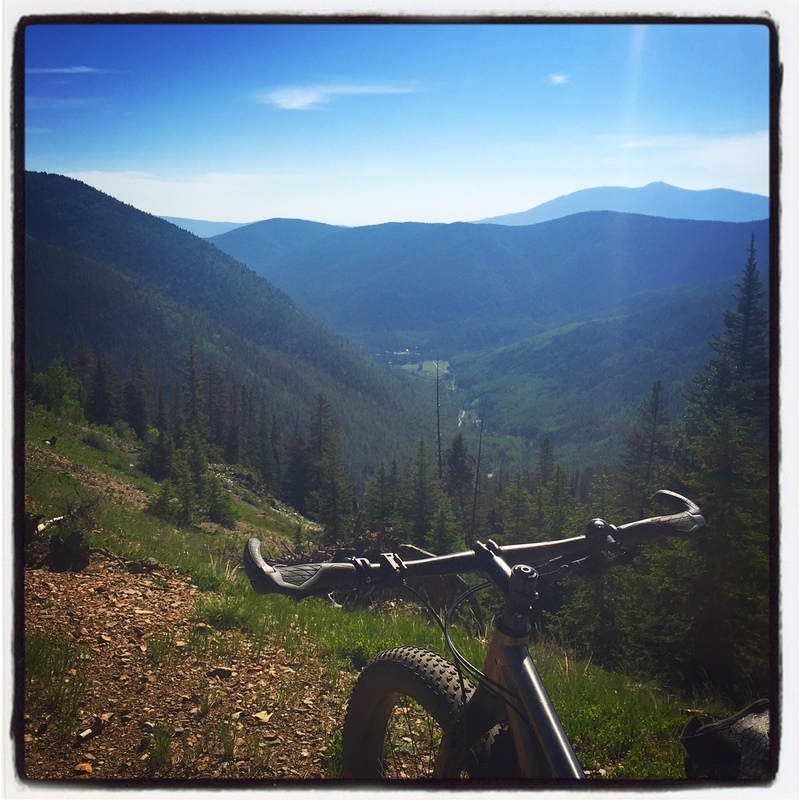 This entry was posted in Favorite Rides and tagged 29 plus, best, bontrager, bull of the woods, carver, frazier mountain, map, midfat, mountain biking, new mexico, niner, northside, rides, taos, trails. Bookmark the permalink.